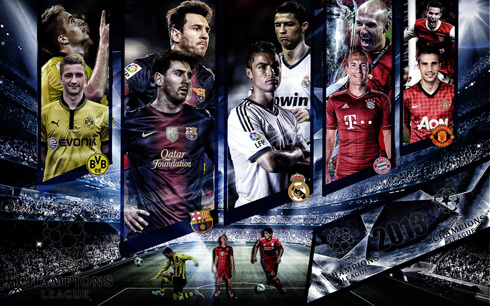 ﻿ Champions League quarter-finals preview: Live drama in Europe! 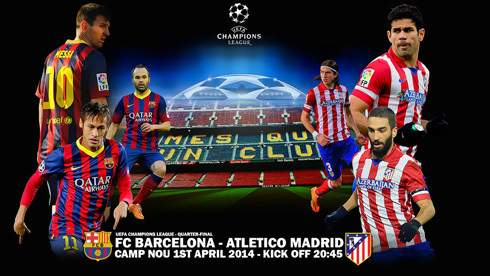 01.04.2014 » Champions League quarter-finals preview: Live drama in Europe! The first day of these quarter-finals provide us with what is, on paper, the most lopsided Champions League fixture of the draw: David Moyes's Manchester United host Pep Guardiola's Bayern Munich at Old Trafford. As reigning champions of the British Premier League, it's no secret that their current position in 7th place in their domestic league has many United fans worried about their chances. Their season has been littered with poor performances, seeming to lack in both tactical awareness and overall enthusiasm. Moyes joined Man Utd at the start of the season, with the task of replacing the managerial legend Sir Alex Ferguson. Things have not gone according to plan, and at the rate they're going, not only will they not retain their league title but this UEFA Champions League campaign could be the last one Manchester United players see for a while. If they fail to break into the top four of their league, where currently Liverpool, Manchester City, Arsenal and Chelsea (the only other English team in the quarter-finals) reside, Manchester United may not have any chance at all to challenge for European glory next season. With that in mind they'll be hoping to right their wayward ship. Last Saturday, they put in one of their best performances of the season, coming from being down 0-1 to win against Aston Villa 4-1. A brace for Wayne Rooney, Juan Mata's first goal in a Manchester United shirt and a stoppage time bonus goal from Javier Hernandez, showed that with midfielders like Juan Mata and Shinji Kagawa playing in the proper positions, this team can create chances and finish them. Wayne Rooney is a natural finisher and with Robin van Persie set to miss both legs of the quarter-finals due to injury, the former Cristiano Ronaldo's teammate will have to be at his best to have any hope of leading his team into victory. Given their difficult season, Man United could not have asked for a tougher opponent to try and redeem their season against. Bayern Munich, who also faced a management change after their most successful season in club history last year, has shown none of the transitional frailties that Manchester United have. The highly decorated Pep Guardiola, former manager of FC Barcelona during the most successful period in the club's history, took over at Bayern Munich last summer. While his winning record is incredible, there are some fans, including club legend Franz Beckenbauer, who don't appreciate the possession-style passing football known as tiki-taka, that Guardiola utilizes to taunt and strangle his opponents into submission. The players, at least, seem to be enjoying their football and they have in spades what Manchester United has sorely been missing: confidence. Bayern Munich shows no signs of slowing down, and last Tuesday with a 3-1 win over Hertha Berlin, they sealed their 2nd consecutive Bundesliga title. With 7 rounds still left in the season, this sets a record for the earliest title win in the Bundesliga. Toni Kroos, Mario Gotze and Franck Ribery all scored that day, whilst players of the highest quality Thomas Muller and Arjen Robben started on the bench. Bayern Munhen arguably has the deepest and most versatile squad in the world at the moment and they come into this tie relieved of domestic league pressure and clearly focused on retaining their title as champions of Europe as well. Right now, it's up to Manchester United to stop them, but most bets will be placed safely on the giants from Germany at this stage. Tuesday is "April Fools' Day", and given their respective accomplishments, I expect we'll be seeing Moyes’s picture under an "April Fool" headline rather than Guardiola's. At the same time and 1000 miles away at the Camp Nou, Guardiola's former club FC Barcelona will be hosting the current Spanish league leaders Atletico Madrid. Now under the helm of new manager Gerardo "Tata" Martino, Barcelona are on a mission to wipe away the sting of last season's semifinal thrashing from Bayern Munich. However, Atletico Madrid has been a true thorn in the side of Spanish giants Barcelona and Real Madrid all season. They've held on to the lead in La Liga longer than many expected. Last season, their title race seemed to lose steam after the winter break, as Barcelona pulled too far ahead to be able to catch. This season, however, the 3 teams are much closer. Barça had been at the top of La Liga for 59 straight weeks until early last February, when a stumble in form and an opportunity taken from Atletico Madrid allowed "Los Rojiblancos" to dethrone the kings. Since then, it's been a mad dash for points. 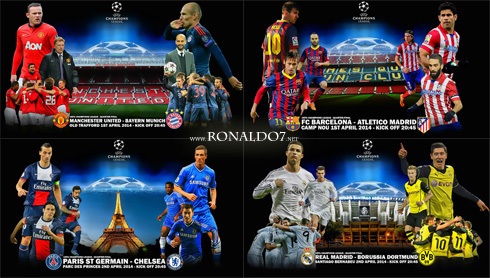 The favorite for this Champions League quarterfinal is almost impossible to decide. Neither team has defeated the other this season in a match. Barcelona has history on their side, but Atletico Madrid have shown their desire to rewrite history again and again this season. Barcelona comes to the match on the back of two big wins. They defeated Real Madrid in a tense 3-4 win at the Santiago Bernabéu last Sunday, which was a must-win match in order for Barcelona to stay in the title race. Three days later, Real Madrid lost their second match in a row away to an inspired Sevilla, paving the way for Barcelona to climb back to 2nd place, just 1 point behind Atletico Madrid now. Barcelona's best bit of news is that talismans Lionel Messi and Andres Iniesta, the architects for some of Barcelona's best trophy-winning campaigns, are in their best form of the season. While Messi spent much of this season injured and Iniesta spent more time than normal on the bench, the rest of the team has done well to maintain a winning atmosphere. With these two back at their best, it only increases their chances of advancing. In their last ten matches, Barça has scored 33 goals and kept 6 clean sheets. Four of those clean sheets belong to Victor Valdes whose season (and most likely his FC Barcelona career) came to an abrupt end last Wednesday, when he suffered a horrible ACL injury. Barcelona's defense has always been the subject of much criticism, but with Valdés being one of their outstanding players of the season, only time will tell if fill-in goalkeeper José Manuel Pinto will be able to lead from the back through the most challenging matches ahead. Losing Valdés was a huge blow to Barcelona's plans, but with Valdés being so popular amongst the fans and his teammates, it may provide extra enthusiasm for the team to perform well in his absence in order to dedicate the victory to him. Only a handful of teams in the Spanish league, and even in the world, can hold their own against FC Barcelona. Atletico Madrid is one of those teams. With recent scorelines between the two reading like 0-0 and 1-1, it's plain to see that Atletico's defense have developed a solid ability to quell Barcelona's immense attacking prowess. With the likes of Juanfran, Miranda, Godin and Filipe Luis playing calmly and confidently, it's been extremely difficult for any team to break through on Atletico Madrid’s goal. Once an attack does break through, there is still a goalkeeper called Thibaut Courtois left to beat. The 21-year-old, 6'6'' goalkeeper from Belgium, on loan for his second season from Chelsea, has been one of the revelations of the season in the world of football. At such a young age, and with practice stopping shots from the likes of Cristiano Ronaldo and Lionel Messi, this goalkeeper can have a huge impact on any match he takes part in. At the other end, Atletico Madrid has plenty attack of their own. Diego Costa is in the 2nd place for goals scored in La Liga, sandwiched between Cristiano Ronaldo in 1st and Lionel Messi in 3rd. Former Barcelona man and Spain striker David Villa also has plenty of knowledge and experience to bring to the pitch he once called home, and he'll be looking to hit the back of a net that he's hit many times before. Atletico Madrid come into the game off of a satisfying 2-1 away win at the San Mamés against Athletic Bilbao, one of the teams that both Real Madrid and Barcelona failed to defeat in their most recent meetings. This could prove to be one of the tightest matches of the quarter-finals and, aside from the historical significance, if Barcelona were to see defeat, it would be hard to argue that it would really be an upset. 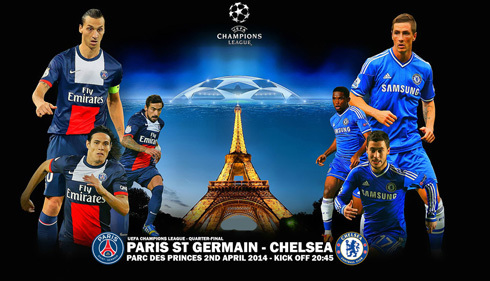 On Wednesday, Ligue 1 leaders Paris Saint-Germain host Jose Mourinho's Premier League contending team Chelsea. PSG are 13 points clear of rivals AS Monaco and look a shoe-in to clinch another league title. Last season in the Champions League and while under the management of Carlo Ancelotti, PSG nearly ousted a flailing Barcelona. This year, they'll be looking for revenge with their new manager Laurent Blanc. Unlike Chelsea, PSG haven't lost a match since January. PSG are a wonderfully balanced team with great defensive players like Thiago Silva from Brazil, midfield talents like Cabaye and Matuidi, and a frighteningly dominant attacking duo of Edison Cavani and Zlatan Ibrahimovic, who between the two of them have scored 40 goals for their club this season. Chelsea, on the other hand, has been a bit unpredictable this season. They've managed to maintain a position near the top of the Premier League without quite convincing neutral fans of their capability to dominate. They've lost 2 of their last 4 matches and are heading into the game on Wednesday fresh off a 1-0 loss to 16th place Crystal Palace, albeit to an own goal from John Terry. After the match, Mourinho praised the consistency of his defensive players but hinted that the rest of his squad underperformed and did not have the quality necessary for titles just yet. The Special One has been playing these reverse psychology mind games with the club and his fans all season, and so far the results have been solid enough to keep them alive in both the domestic league and the Champions League. Samuel Eto'o suffered a hamstring injury during Chelsea's recent 6-0 rout over Arsenal last week and is likely to miss this first Champions League clash. He has been Chelsea's most effective striker this season, with only midfielder Eden Hazard scoring more goals than him. Forwards Fernando Torres and Demba Ba haven't proven their worth leading the Chelsea line at all this season, and most all of Chelsea's goals have come from their midfield players. The Blues seems to be in a period of growth and PSG are out to prove that they are now fully grown into solid contenders, so this should be a tense matchup. The last game on Wednesday will be a good old-fashioned rematch of last year's semi-finals meeting between Real Madrid and Borussia Dortmund. Both teams have been through quite a few personnel changes since last season, but Dortmund is only one of two quarter-finals teams (the other being Atletico Madrid) that has the same manager as last season. The biggest difference on Wednesday could be that BVB's star striker Robert Lewandowski is set to miss the first leg through suspension. Last season in the first leg, he put away 4 goals against the Spanish side, leaving José Mourinho and his men stunned and with a nearly impossible task for the 2nd leg. 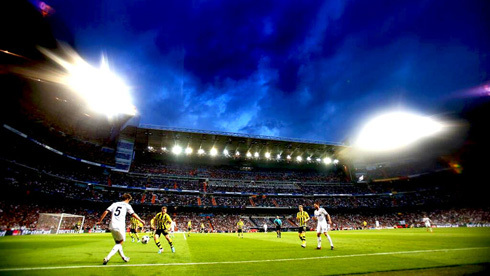 This season, the first game will take place at the Bernabéu, which hasn't been the safest place for Real Madrid this season against the bigger clubs. Champions League has been a different story for Real Madrid than La Liga, though. The team has scored 29 goals in only 8 UCL matches played, the most of any team. They have 7 wins and 1 draw, while BVB have 5 wins and 3 losses with only 16 goals scored. Borussia Dortmund does not have the unbeaten streak they carried to the final last year and they don't appear nearly as menacing without it. Iker Casillas will once again be between the sticks, leading his team to what most would expect to be a victory. The 2-time FIFA Ballon d'or winner Cristiano Ronaldo is having one of the best seasons of his career, and is the leading goalscorer in the Champions League with 13 already. Garreth Bale has enjoyed his return to Champions League football as well, netting 4 goals so far. Angel Di Maria has arguably been Real Madrid's 2nd best player of the season. He's been assisting from midfield and scoring goals, as well as creating a very high tempo in most matches with his blistering pace. Everyone knows how important Real Madrid's 10th Champions League title, also known as "La Decima", is to the players, the staff and the fans. Add that to the motivation of defeating last season's dream-killers and Real Madrid look poised to advance. Borussia Dortmund have to maintain a domestic fight against Schalke 04, Bayer Leverkusen and VfL Wolfsburg in order to stay in the top 3 and qualify for the Champions League next year, but that shouldn't be too difficult for them. If there is one thing we know about Jurgen Klopp's men, it's that they are fighters. Without Lewandowski they may find it difficult to come away with a win on Wednesday, but with excellent players such as Mats Hummels, Ilkay Gundogan, Marco Reus and Nuri Sahin, BVB could still control a large portion of the game and maintain a reasonable result for the second leg they'll play at home. Xabi Alonso, who has been a key figure this season in Real Madrid but who is recently suffering from a bad patch of performances, will hope to take advantage of the situation and lead Ronaldo and company into a comfortable position in order to make it to the next stage. Whatever the results may be, the teams that have made it this far have done so by playing their own unique types of football, displaying their strengths and exploiting others' weaknesses. 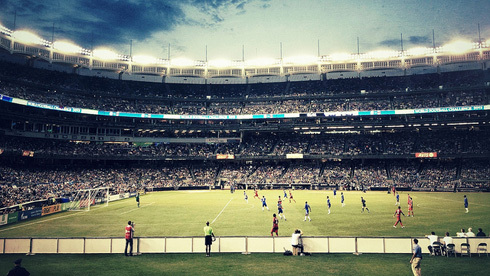 Over the remaining games of the season, we'll get to see out on the pitch which team is able to have the final word. Cristiano Ronaldo's next game for Real Madrid will be against Borussia Dortmund, for the UEFA Champions League quarter-finals first leg in the Bernabéu, on April 2 of 2014. 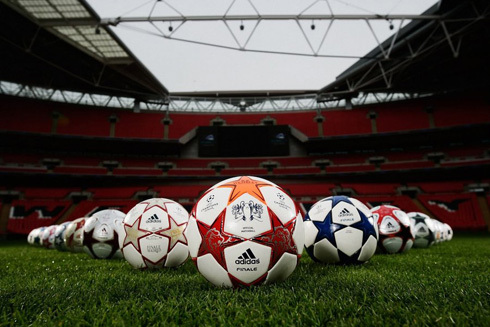 You can watch Juventus live stream, Real Madrid vs Borussia Dortmund live, Barça vs Atletico Madrid streaming, Man Utd vs Bayern Munich online and PSG vs Chelsea free, all matches provided from our soccer live section.